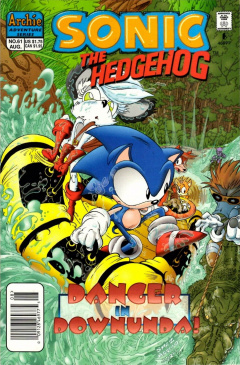 Sonic the Hedgehog 61 is the sixty-first issue of the Sonic the Hedgehog comic. This comic features three stories, a 12 page main story, called "Outback Gut Check", a four page second story, titled "Total Turbulence", and a six page tertiary story, called "Tales of The Freedom Fighters - On His Majesty's Secret Service". Downunda Freedom Fighters Guru Emu and Wombat Stu are suspended in a cage above. Below them stands Sonic the Hedgehog, Miles "Tails" Prower, as well as Downunda Freedom Fighters Walt the Wallaby and Barby Koala. They are surrounded by a horde of platypus enemies. At Sonic's command, they strike back, and the foes are defeated. Sonic goes into a spin and promptly cuts the captured Emu and Stu loose. After a short celebration, Walt tells the story of how they got into this mess: After Bunnie Rabbot and Antoine D'Coolette escaped the prison camp in Downunda during the Ultimate Annihilator crisis, the remaining animals in Downunda began to rebuild their lives. They cleaned up the prison site, and all seemed to be going well. But one day, for no apparent reason, their friend Duck "Bill" Platypus took off and went renegade. Not long after, Duck came back, but now leading a guerrilla band of platypus raiders. They ruined the reconstruction efforts, and work stopped. Some time later, they received a message from Bill, who seemingly wanted to negotiate and end to the hostilities. Emu and Stu agreed to meet him, but it was just a ploy and the two were ambushed, captured and caged. A couple days later, Sonic and Tails arrived in their bi-plane unexpectedly. The two were under orders from the Mobotropolis Council to check in on the Downunda crew, and found that they needed help. With a little searching, they found Emu and Stu. Now they're going to press forward and find out what's the deal with their former teammate. They ride a raft down the river. Sonic and Walt are at odds with just who the leader is supposed to be, while Barby seems to be a bit enamored with Tails. Out of the bushes pops a few platypus marauders and alligators, which the team dispatches without much effort. With a super Sonic spin propelling them forward, they arrive at Bill's hideout. Sonic unplugs the robot before it could finish the warning. Sonic has orders from the King to confiscate any hostile robots, and the Downunda Freedom Fighters defer to the King. So Sonic and Tails take off on their next adventure, Crocbot strapped to their bi-plane. All seems well. For now. Young Geoffrey St. John and aging subordinate Agent Fleming barely evade the explosion caused by a death trap leftover by Dr. Robotnik. This close call causes Agent Fleming to question his ability to continue serving of the Secret Service. Dejected and believing himself to be too old to continue, the aging agent retires, to Geoffrey's sadness. This retirement prompts King Maxamillian Acorn to order Geoffrey to gather some new recruits for the service, preferably some fresh young blood. Geoffrey obeys. But the first thing he does is set course for Angel Island, where he tracks down a chameleon, former agent Valdez. Valdez drafted, they fly over Downunda, seeing Wombat Stu below. Geoffrey asks Stu if he'd like to join, and Stu, bored after the defeat of Crocbot, obliges. Back in Mobotropolis, St. John finds Hershey the Cat. Princess Sally has tasked her with the humdrum job of coordinating the various work details on rebuilding the city. Geoffrey hands her a disc, and tells her to show up at the armory in the morning. Hershey's concerned about disobeying the Princess, but Geoffrey tells her that he'll square things with the Princess on her behalf. The story "Total Turbulence" marked the debut of penciller Steven Butler, who still pencils for the comic to this day.